Just north of the Lodge on Route 10, there’s a large rock outcropping. This provided a base for a bridge over Route 10. 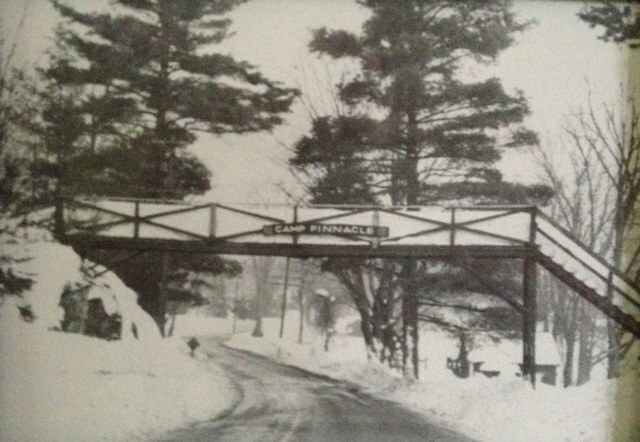 The bridge was part of Camp Pinnacle – an overnight boys camp that covered the land from Pinnacle Hill Road (to the north) down to the Lodge property. The boys would walk over the bridge and down the stairs to the (long gone) boat house and changing rooms, and then to a beach by the current House by the Lake. This photo looks south, toward the Lodge. We don’t really know when this picture was taken, but the bridge was removed in the early 1980’s.